Prawns cooked in coconut sauce and spices. Fish with potatoes cooked in curry sauce. Mild prawns curry cooked with yogurt, mustard and spices. 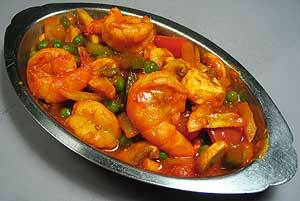 Prawns cooked with bell peppers, onions, peas & mushrooms in curry sauce.